There are many factors to consider when searching for the perfect fireplace screen, the quality of protection, access to your fireplace, and overall appearance, just to name a few. This fireplace screen scores perfectly on all considerations! 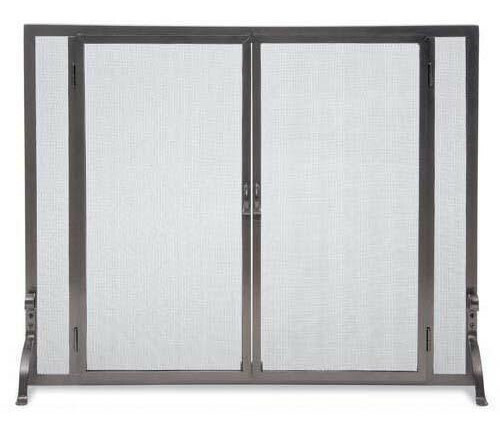 The durable steel construction of this screen ensures that it will remain in place protecting your family. This fireplace screen also provides ease of access to your fire, without moving the screen out of the way. The fully-functional doors are the perfect compromise, and make this fireplace screen a step above the rest. Don't worry that a screen will detract from the appearance of your fireplace. This elegant screen actually adds to the style of your room. You'll never be ashamed to have it on your hearth! Do the small leveling feet on the back have holes so they can be attached to the floor? Does this have glass doors or mesh? Does this Pilgrim Vintage iron fireplace screen with full-height doors have any legs on the back of the door? This item has small leveling feet that are set inward on the screen. They are designed not to affect the mounting of the screen against your fireplace. Can you describe the color of the vintage iron? Is it more black, nickel, or silver? Is it shiny or matted? The vintage iron finish is comparable to a very dark grey finish, close to graphite. The finish is matte, with a slightly textured feel.